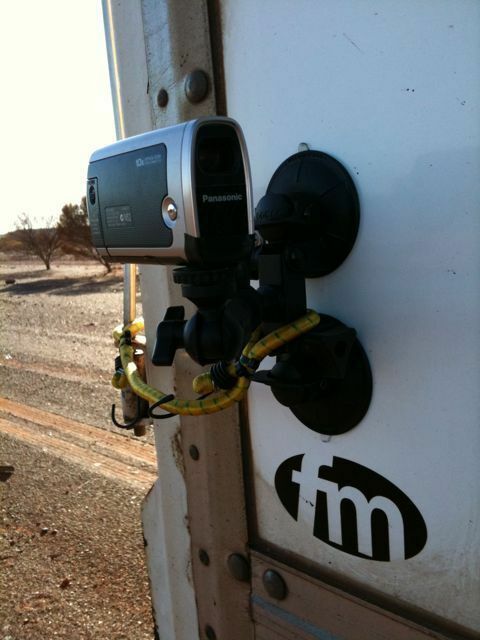 Got a little bored this morning so thought I would attatch my Panasonic video camera to the side of my third trailer and film a little bit of Meekatharra. I have a pretty sturdy twin suction cup camera mount which will let me position my camera just about anywhere there is a glass or (clean) painted surface. I always improvise some sort of a safety tether when mounting it externally on a moving vehicle – it would break my heart to see it lose suction and hit the road at 100km/h or go under a wheel(s). I positioned the video camera on the rear right side of my rear (3rd) trailer, facing it forward so it would capture all three trailers and the prime mover as well as the street scene in the main street of Meekatharra as I drove through, refuelled, and continued on, leaving the town behind. I am posting this from “on the road” but as soon as I can upload the video to Youtube I will embed it here.